This small series is the result of a week of intensively testing a number of Linux–based operating systems. It was inspired by two of my “digital heroes” (totally unbeknown to them, though): Molly E. Holzschlag, one of the women who constantly stir and shake to make the web open and a nicer place to visit, and Linus Torvalds, the man who proved that computers may work efficiently — if only the software running them is written properly. A KDE wallpaper. Source. Licence not specified. Linux–based operating sytems used to have a reputation for being difficult to install and use. And their hardware support — a mess, to say the least. Luckily, these days are long gone. Today, most of them are easier to handle and considerably more reliable than what system the precious reader may have currently installed on his or her device of choice. To many, this may not be obvious at this very moment, but “to Linux or not to Linux” is not the question anymore. The actual question is whether you want to have control over your operating system (and by such also your computer) or rather be controlled by it. I am admittedly no expert on everything software, but I have installed, used, and tweaked enough operating systems over the decades to exactly know what I need to work efficiently and what services I expect both my hardware and software to provide without faux drama. I honestly give crap for the operating system or hardware I am supposed to use to be a “cool kid” — and much less for people and manufacturers who try to convince me that I need to repent and eventually submit to their alleged superiority. If stuff happens to work (for me), fine. If not, I am out the door to never return. When it comes to protect valuable resources (time, energy, etc. ), I tend to make no prisoners (if you pardon this metaphor). Anyway. So I subjected myself to conduct a challenge which was to last from Friday afternoon to Monday morning, trying to find an operating system I would install, if I didn’t already have a smoothly working production environment. Yet one thing led to another, and the following Friday saw me still switching between one candidate my reason preferred and one that had taken my heart in a jiffy. During this “extended weekend”, there was not an awful lot to learn, but some things did take me by surprise. I will try my best to let not show my preferences as this could possibly influence the precious reader. Such is not my intention, and it wouldn’t be helpful. You should find the operating system that is just right for you, not take the one that is just right for me. Part 1: Which Linux–based Operating Sytem Best to Use on a Chromebook (When ChromeOS Is Not an Option)? 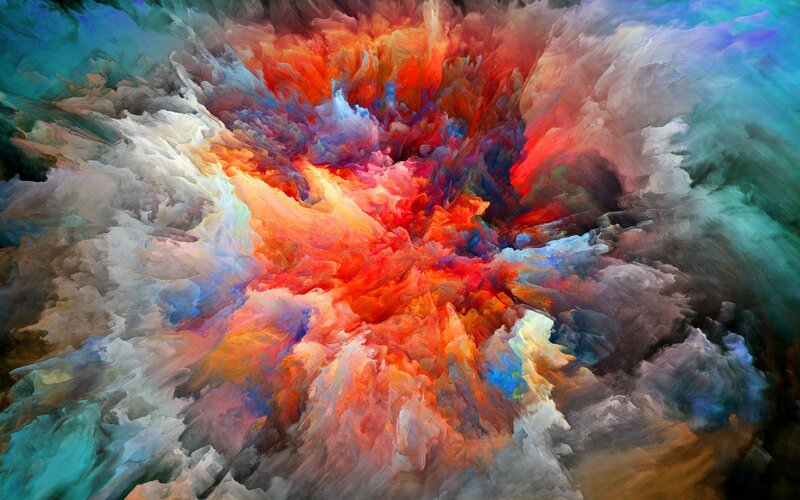 Colophon: The abstract painting “Smoke Paint Brightness Explosion” represents the world of Linux–based operating systems quite accurately (for me). It’s been published as a KDE wallpaper and is available from the source linked above.